This page allows you to find directions, read reviews and make reservations at the Grove Isle Hotel in Miami Beach. Rates: Low season from $135. High season from $235. Grove Isle is a luxury resort located on its own 20-acre island. This hotel is ideal for a romantic getaway, social events, and corporate meetings. Each room has a private balcony with views of Biscayne Bay. With only 49 rooms, Grove Isle Resort offers the intimacy of a private residence. Visitors and hotel guests can enjoy oceanfront dining at Baleen. Casual dining is offered by the pool or in the tropical garden. Room service is also available. Wireless Internet access connections are available in all guestrrooms and public areas of the hotel. Need a limo to Grove Isle Hotel? Call Miami limo service. 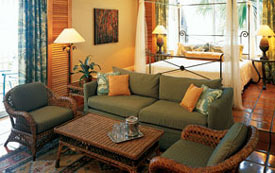 Click HERE for Grove Isle Lodging Information. • Leaving the Airport, follow signs to 836 East (downtown). • Take the N.W. 17th Ave. South Exit onto 17th Ave.
• Turn Right on South Bayshore Drive. • Turn Left on Fair Isle Street. • Fair Isle Street becomes Grove Isle Drive. • Grove Isle is on the Right side of the street. The Grove Isle is located at 4 Grove Isle Drive, Coconut Grove, FL 33133. Use our Miami hotel map to find the exact location. Grove Isle Hotel in Miami Beach. Miami hotel reservations.